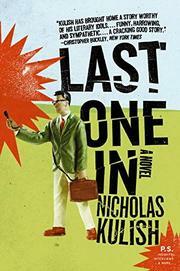 A compelling first novel uses humor to illuminate the deadly absurdities of war. Though Kulish reported from Iraq as an embedded journalist for the Wall Street Journal (he has since become an editorial writer for the New York Times), this fictional debut extends well beyond his own experience. His protagonist is a young, hapless gossip columnist named Jimmy Stephens, who works for a New York tabloid that is in the midst of repositioning itself to replace fluff with harder news. After bungling a supposed scoop, Stephens is given one last chance to save his job: Go to Iraq on the eve of war and travel with the Marines as an embedded reporter. Why Stephens? In an unfortunate (and unlikely) coincidence, he shares the same name as a distinguished war correspondent who has suffered an accident, and the list of approved embedded reporters permits no substitutions. So, this James Stephens will have to pass for that one, though it becomes immediately apparent that the younger Stephens’ fields of expertise—bedding little-known models, exploiting his expense account for impossibly priced sushi, chasing rumors—will do him little good in a war-ravaged desert. Yet Stephens ultimately bonds better with some of the enlisted men who are closer to his age than with the self-important war correspondents and the officers they befriend. And he employs some unconventional methods for using the tools of his trade to gain the access he needs for the stories he writes, which aren’t necessarily the stories that his editors back home want to read. Ultimately, Jimmy experiences a number of revelations—about the nature of journalism, about the fraternity of soldiers, about the unpredictability of war, about his own values. He leaves the war a very different reporter. Kulish arrives at a different sort of truth about the war in Iraq than can be found in nonfiction accounts, and shows a deft command of tone—from the slapstick to the tragic—in the process.